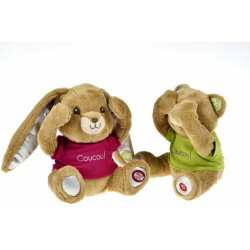 In the Coucou Family, here is the Teddy bear in its new size Mini to play peek-a-boo with baby! Still as fun, and so more cute! now in the new size Mini! Press the paw of this Pioupiou Teddy bear, and let's go for over 30 seconds of hide-an-seek between baby and his teddy. His laugh is so communicative that the baby will not be having fun alone very long ! 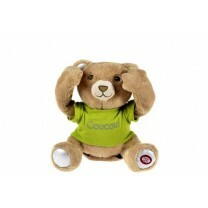 Unlike the video, the teddy speaks in french : "Coucou" instead of "peek-a-boo !". the famous swiss psychologist Jean Piaget highlighted the importance of the hide-and-seek for babies. Infact, when you hide your face, baby thinks it has disappear. When the same face reappears, baby is suprised and discover more and more the object pemanency. Play with the Peek-a-boo teddy bear ! help baby to handle séparations easily, at night in bed for instance. a precious good for his future.